Four months after we first deployed our monitoring equipment in Iceland, we have now returned to collect our samples, download our first data, and ensure that the equipment is ready to withstand whatever the Arctic winter throws at it. Thanks to the fantastic efforts of Hlynur Óskarsson and his team at the Agricultural University of Iceland, the data collection has proceeded trouble-free so far, and so we thought we would share some of the data with you to highlight the type of information that we are collecting. 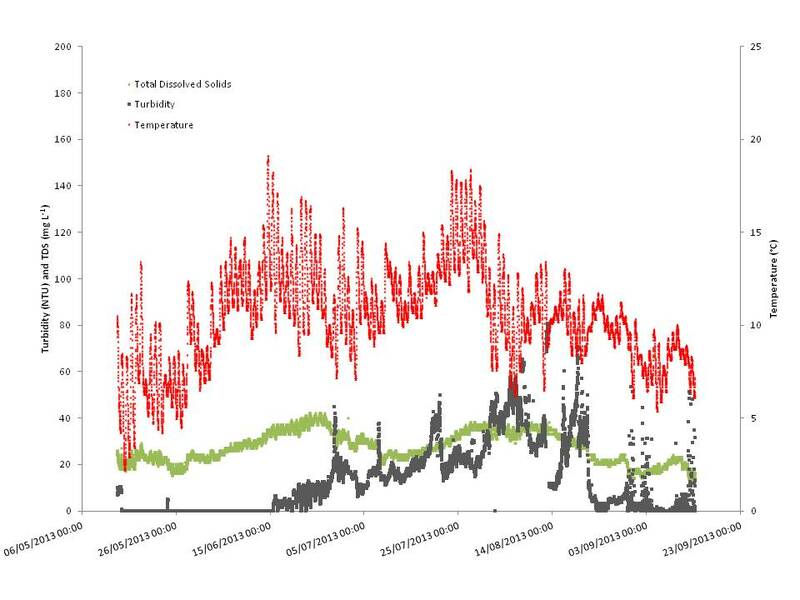 Below is a graph showing the start of some of the diurnal-seasonal cycles that we are observing in water temperature, total dissolved solids (dissolved substances that can give the river water a distinctive colour) and turbidity (a surrogate measurement of the river’s sediment levels). These data are supported by further measurements, not shown here, including meteorological data (precipitation, air temperature, wind speed/direction) and hydrological data (the volume of water passing through the river every minute), which combined are giving us the new insight into the characteristics of these types of Arctic rivers, which support diverse aquatic communities including valuable salmonid fish species. On our journey back from the Litla-Skard field site, we recorded this short video, shot from one of the World’s most productive natural thermal springs – Deildartunguhver – an impressive feature that is used to heat homes in the local towns and villages, in addition to heating greenhouses to make it possible to grow tomatoes in the Arctic! We will update you on the Litla-Skard data collection when more data become available, and next time we will be able to include the hydrological and meteorological data so the story will become clearer. This short video explains why the ECOFORS project is monitoring the Teno River as part of a network of contrasting ‘reference-condition’ or minimally-disturbed river sites that are being monitored across Europe. 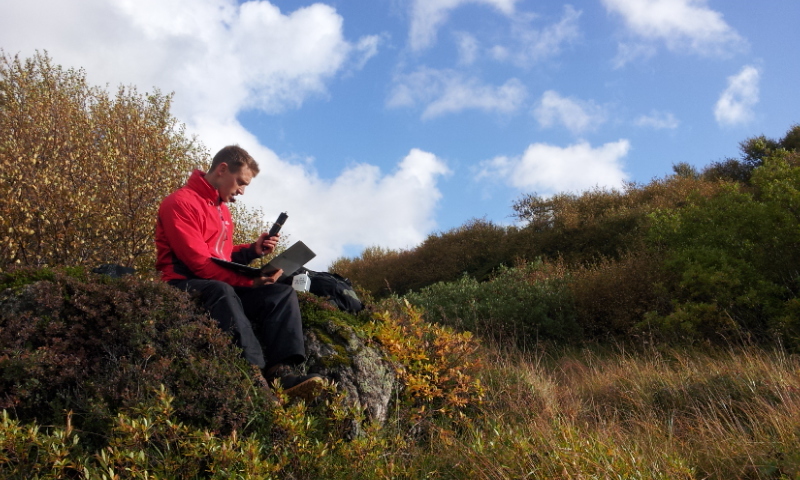 Here is a short video explaining some of the work we’ve been doing on our first research trip instrumenting the Litla-Skard catchment in Iceland. The video and the photographs below show one of the two monitoring points that we have set-up this week. These automated water quality monitoring points will be supplemented by manual grab samples of water quality on a monthly basis, and these data will be supported by an on-site meteorogical and hydrological gauging station, in addition to survey data on the soil types, geology, and vegetation types within the catchment. The purpose of instrumenting this site is explained in more detail in my previous blog article which is available here. 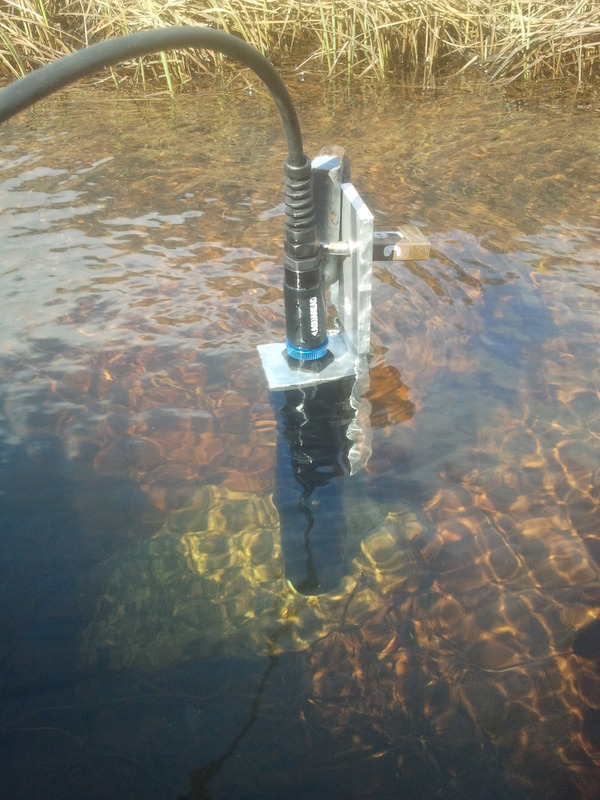 Aquaread multi-parameter water quality probe in Litla-Skard’s monitoring point 2. 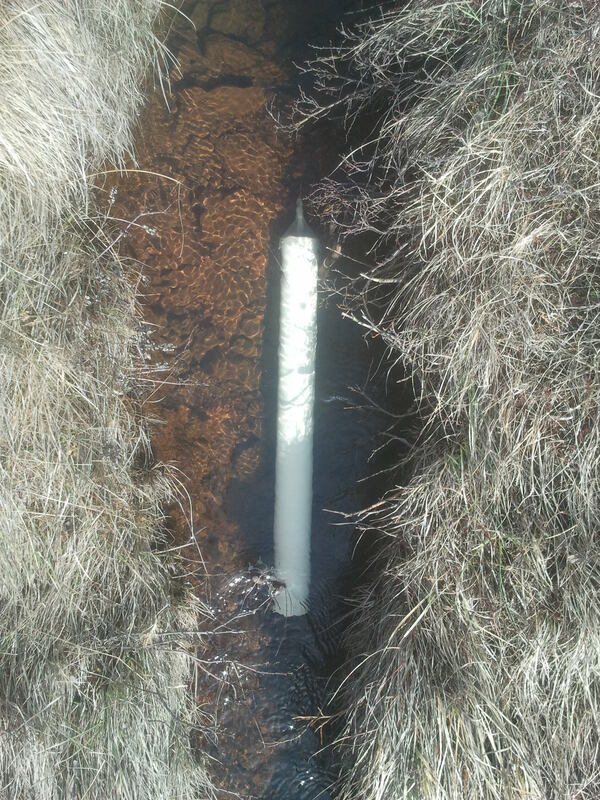 A time-intergrating sediment sampler at Litla-Skard’s monitoring point 2. With just five days left until we are due to make our first INTERACT field trip, I thought I would just post some information about the ECOFORS project, to let you know what we are aiming to achieve through this research and why it is important. 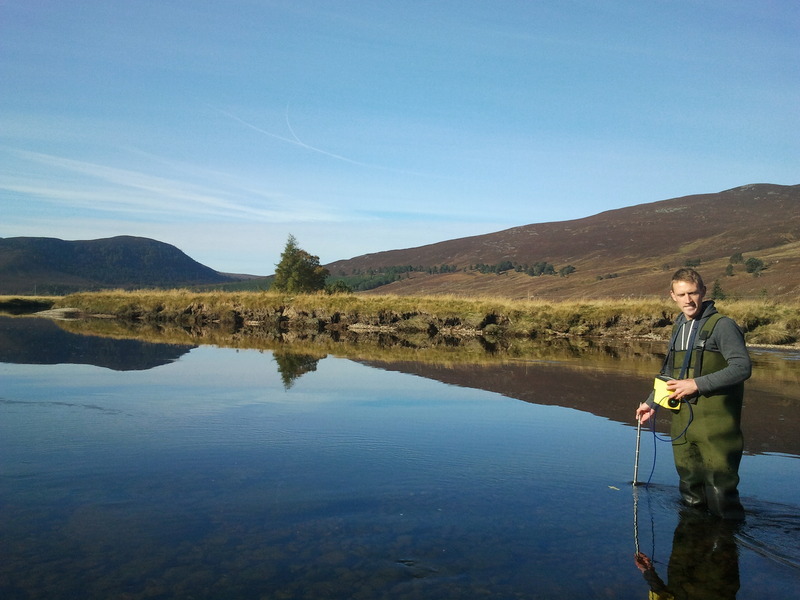 The ECOFORS project will monitor river water quality in the extreme river environments of the Arctic, including one of Europe’s best salmon rivers, in a bid to understand the contrasting water quality requirements of different freshwater ecosystems. The project, which is funded by the European Union’s INTERACT funding scheme, builds on an existing research at the University of Brighton, led by myself (Dr Gary Bilotta) and Magdalena Grove of the School of Environment and Technology. We will be monitoring the water quality of ‘reference-condition’ (minimal human disturbance) rivers in northern Iceland and northern Finland. The project will add to existing water quality research, by myself and PhD student Magdalena Grove, in reference-condition rivers in the more temperate climate of the UK. These rivers are being used as models of the water quality required to support different freshwater communities in catchments with contrasting environmental characteristics, including climate and geology. The research will feed into the development of improved water quality guidelines to support healthy freshwater ecosystems – a requirement of the European Union’s Water Framework Directive legislation. Freshwater ecosystems are incredibly valuable, providing humans with ecosystem services worth more than $1.7 trillion per annum, but these ecosystems are currently threatened by water pollution. One of the most common forms of water pollution is excessive levels of particulate matter, from nano-particles to sand-sized sediments. The transport of particulate matter by rivers to the oceans represents an important process of the global erosion process, an important component of global biogeochemical cycles, and is an essential constituent of freshwater ecosystems, critical to habitat heterogeneity and ecological functioning. However, when human activity causes a significant deviation in the dynamics of particulate matter from ‘natural’ or ‘reference condition’ dynamics, this can cause ecological degradation. Ultimately, this can lead to a significant decline in the associated ecosystem services. It is therefore essential that particulate matter is managed in order to minimise these impacts. However, at the moment we have a poor understanding of what the ‘natural’ or ‘reference condition’ dynamics of particulate matter should be in a given environment. Current water quality guidelines, which are designed to manage this pollutant and protect a whole range of different freshwater communities, are often blanket guideline values with limited ecological basis. Our research aims to address this and improve current water quality guidelines so that firstly they reflect the natural variation in water quality that should be expected in different types of environments, and secondly they are more closely aligned to what is needed to sustain different communities of freshwater organisms. According to existing water quality guidelines for particulate matter in Europe, concentrations should not exceed 25 mg per litre in waters suitable for salmonid and cyprinid fish. However, recent research led by myself, in which the team examined background concentrations of particulate matter in 638 reference condition stream and river sites in the UK (representing 42 different freshwater ecosystem types), demonstrated that levels of particulate matter vary significantly among different ecosystem types. For instance, in one ecosystem type, which is home to the Atlantic salmon, the particulate matter levels were 15 times lower than the current guideline, but in another ecosystem type the levels exceeded the guideline level, despite the ecosystem being in a healthy state. We believe that this initial study shows that specific quality guidelines are needed for different ecosystems because in some ecosystems the particulate matter provides organisms with a food source and the habitat that the organisms need to live and breed in, whilst in other ecosystems particulate matter can harm organisms, even when at relatively low concentrations. This previous research, which is published in the international journal Water Research, has already attracted attention of European policymakers. It has big implications for those involved in managing land use and water quality across Europe because under European legislation land owners and water users who are perceived to be contributing to the failure of a waterbody to meet water quality guidelines, may face fines and have to contribute to clean-up costs. We are now developing a tool for setting ecosystem-specific water quality guidelines. This will only be achieved through high-resolution monitoring of particulate matter in natural or reference-condition rivers in a range of environments and climates, including the colder climates of the Arctic. The Arctic research project will be supported by state-of-the-art monitoring equipment provided by our industrial sponsor, Aquaread Ltd, an award-winning designer and manufacturer of water quality monitoring equipment. The team will be using Aquaread’s AP-2000 multi-parameter water quality testing probe, which will be installed in-situ within the water column of each river. The Aquaprobe will be recording turbidity (which is a surrogate measure of particulate matter), dissolved oxygen, pH, total dissolved solids, and temperature on a 15 minute resolution. 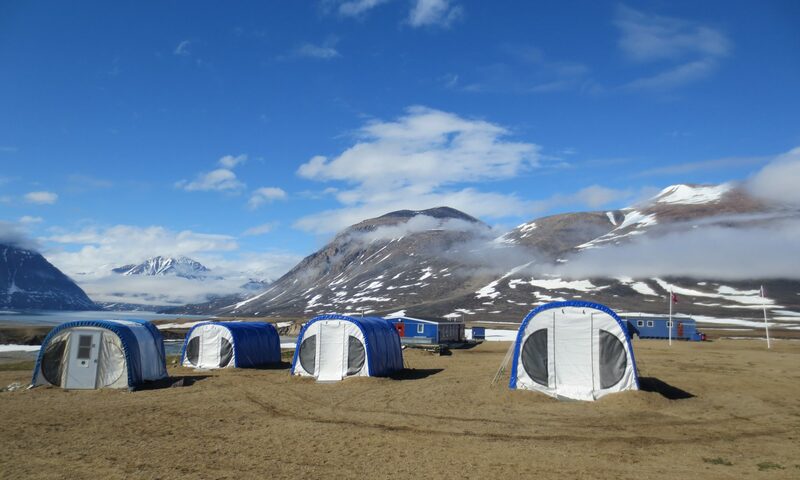 The data will be logged with Aquaread’s Aqualogger that will be installed streamside with thermal insulation to protect the electronic device from the extreme Arctic climate where mean annual temperatures at the sites are around just 2°C and winter temperatures can get as low as -30°C. We have spent the last few weeks testing the equipment and insulating materials in a controlled environmental chamber to ensure that the performance will not be impaired in these conditions, at least until the water freezes around the Aquaprobe. The Aquaprobe and Aqualogger will connected by cables that will be fixed in place and protected from Arctic wildlife such as bears and reindeer. Each reference site will be monitored continuously for at least one year to capture temporal variations in water quality, supplemented by manual grab samples on a monthly basis carried out by field station staff. To find out more about the background to this research, see: Developing environment-specific water quality guidelines for suspended particulate matter, Water Research Volume 46 Issue 7 May 2012. We will be taking plenty of pictures and possibly some video footage whilst we are on our field trips and we will share these via this blog. We will also keep you up to date with our findings, so watch this space!